If your locomotive is DCC-Ready (and has an 8-pin socket on it), simply plug the 8-pin side of the wiring harness into your train. Orient the 8-pin connector so the RED wire is near the number 8 (or triangle) marked on the circuit board. If you have the 8-pin connector in the wrong orientation, the train will run in the wrong direction. This board anticipates low voltage LED lights (20 mA) on your locomotive and does not require resistors. 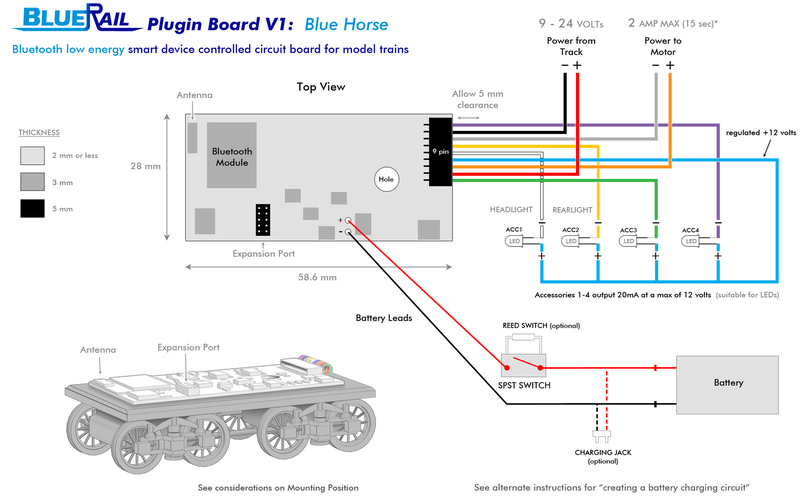 If your locomotive is not DCC-Ready, snip off the 8-pin connector on the harness and connect the colored wires as indicated in the table above and the diagram below. If you are utilizing a battery, it may be connected as indicated in the diagram. Batteries may alternately be connected to the Red/Black wires on the 9 pin harness (if you are sure you will not be using track power as well). THIS ARTICLE shows alternate ways you can wire up a battery. If you are wiring a Bachmann Thomas train, the motor leads are usually Yellow and Brown. If you are wiring a Bachmann locomotime, HERE IS A TABLE with the letter codes commonly stamped on the circuit boards. For more information on the board, please refer to the Our First Board article and the UserGuide, as well as the Articles and Videos links above.